Finally a book that settles the matter of what a Christian should think about depression. I’ve always had trouble arriving at a firm conviction as there is so much conflicting information making the rounds. Charles Hodges is both a doctor and a Christian and has carefully researched the subject in this volume published by Shepherd Press. Don’t panic. Whatever he has to say, he says compassionately. He never has a “just-get-right-with-God” attitude! Still, he demands that the subject be looked at both from the point of verifiable medical fact and the Bible. What could be more fair? He discusses what we have probably all noticed–an amazing number of people now have a diagnosis of having depression. He explains how a so-called “chemical imbalance” in the brain is a theory that has never been proven at any level. He further explains that diseases that have legitimate diagnosis capabilities have a clear pathology (structural and functional cellular changes) that you can see. In depression, or a chemical imbalance, there is no such pathology. There are, however, several ailments that have mood changes as a symptom and he suggests you check these out if you think you are depressed. (He lists them in an appendix). If this is not the case, then likely you are sad. He beautifully shows how our Creator made sadness as an emotion in us to deal with life and drive us to God. Though we may not respond properly, it can help us. Unfortunately, “depression” as a medical diagnosis can be a label that short circuits the process our Creator designed. We quit seeking–we stop at our label instead of the arms of our God. He tackles the issue of so many not only having this diagnosis, but being prescribed anti-depressants as well. Beyond having their own side effects and dangers, these medicines have little success according to studies. Placebos (sugar pills) and no medicine at all have better results in patients! He takes Bible characters like Hannah and shows how they would have gotten a “depression” diagnosis. Their real problem was normal sadness and in being driven to God they got real relief. He really puts the Bible to good uses in later chapters! The last few chapters tackle Bipolar Disorder. It used to be called Manic Depression. He proves it is a rare but real disorder. There are now a wave of people getting a diagnosis of Bipolar Disorder. This is because they came up with Bipolar Disorder II that has a weak criteria that really can’t be verified and now we are giving away a false label and hurting people in the process. He writes in a way that we can all understand. If you want to know what I think on the subject of depression now, just read this book. 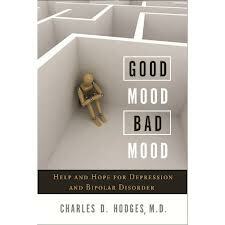 As individuals who will have sadness, worse moods and feel depressed, this book is a real help. Were it fall to us to help someone we think acts depressed this book is an indispensable guide. I give it the highest recommendation. I had a fine Christian lady write me and pointed out a few things to me so I want to clarify and share what I told her. 1. He says 90% of people labeled depressed are only sad, which means 10% do have real medical issues. 2. He says some do feel better with anti-depressants (but some get better with placebos and some with nothing). 3. He says to talk to the doctor before you change your medicine (I SHOULD HAVE TOO). 4. He never writes in a way that treats depression as something to be ashamed of and I agree. It is something to deal with and try to figure out. This kind lady also recommends that we remember that this is just one Christian doctor and we should read others. She recommends Donald P. Hall- “Breaking Through Depression: A Medical and Spiritual Approach to Emotional Wholeness” and Tim LaHaye’s “How to Win Over Depression”. It is good to read widely! I made it sound like this book has the final say on the subject and that is a little strong! I suggest we use this information to encourage and not discourage! Suicide and other such things mean we should be cautious in what we say.I still think this is a great book! Glad to go it! Another interesting book!